As a young girl growing up in Washington D.C., Sa-Roc was exposed to a musical rainbow of artists, including Billie Holiday, Outkast, Bad Brains, Nirvana and Björk. Sometimes, music was her only catharsis. Throughout her adolescence and teenage years, the Rhymesayers MC struggled with body image and self-esteem. Subsequently, she started cutting herself to escape the pain she felt. “I dealt with feeling inadequate or less worthy because I didn’t fit conventional standards of what was considered beautiful,” Sa-Roc explains to HipHopDX. “There was also a lot of unexpressed anger and pain that I didn’t feel comfortable or courageous enough to share with my loved ones, so I took it out on myself. Now 37, Sa-Roc has made peace with her body and quieted the negative self-talk for the most part. (We all have our days.) On 2018’s “Forever,” she freely raps about her physical and emotional scars but with a renewed sense of empowerment from all she’s endured. 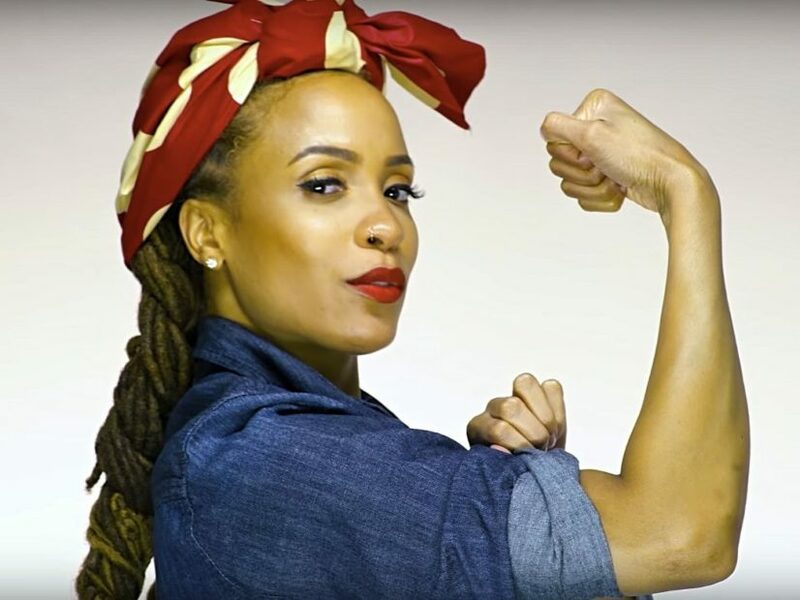 As an artist, she hopes to use her music as a platform to inspire other women to overcome their challenges. But she recognizes social media plays an integral role in littering people’s minds with an impossible standard of not just beauty but also fame, success and wealth. “While a lot of those kinds of issues that I expressed in ‘Forever’ are far behind me, in this current society, we are constantly grappling with issues of self-esteem or self-worth,” she says. “There’s certainly degrees to how those issues manifest, but in the age of social media, this drive to capture these perfect moments and create these perfect lives has us attempting to measure up to these very curated and edited versions of real life. And we’re trying to keep up with the Joneses in a sense. In order to heal together, she insists it’s time to stop perpetuating a false reality. In the age of social media and the seemingly endless pursuit of perfection, that’s not a bad suggestion. “Be exactly who you are,” she says. “Strive to be the best version of yourself but define that on your own terms. Sometimes we feel like our scars — physical or otherwise — make us less than worthy or that they mar us somehow, so we turn inward on ourselves. Last October, Sa-Roc released a video for her latest single, “Goddess Gang.” The explosive track showcases her undeniable confidence, something she really had to work hard to attain. Even now, people often mistake her for a singer rather than an MC — until she grabs the mic. But Sa-Roc is here to break all the misconceptions and stereotypes despite the fact it’s going to be a long, arduous road. There are always going to be certain people who doubt a woman’s ability to rap. In a way, she’s grateful for them because it pushes her to be better. “As I started to become more visible online, there was this disregard and outright disdain for female rappers that I was now seeing on blogs and other digital outlets,” she says. “On videos and new music from women MCs, men would comment things like, ‘I’ll pass’ after openly admitting to not even listening to the music. [They were] dismissively branding female rappers as corny, critiquing the timbre of their voices, etc. It was a really hostile landscape to navigate and reeked of bias. Sa-Roc is convinced it’s a lack of knowledge that’s to blame. Like her name suggests, Sa-Roc was inspired by Funky 4 + 1’s sole female rapper, MC Sha-Rock. “People forget that women have been instrumental in Hip Hop since its inception,” she says. “Most of us are really familiar with the early male Hip Hop icons and pioneers, but women have been present and just as instrumental since the beginning. One of those women, who my name actually pays homage to, is Sha-Rock. As the dark, sordid details of R. Kelly’s predatory behavior (both past and present) come to light and the #MeToo Movement is in full swing, women are finally being heard and enacting change. The shift is also seeping into Hip Hop as women find more opportunities to shine in a culture traditionally dominated by men. “I think where [change is] going to come from is our exhaustion with these outdated notions of what women in Hip Hop should look or sound like,” she says. “We’re tired of being defined by these norms that aren’t even created by us. It’s come to the point — again, I have to keep mentioning social media because that’s a big part of that — where it’s become damaging. But that doesn’t mean she doesn’t support a woman’s right to flaunt her goods — it’s just not how she chooses to navigate her career. “Absolutely no shade to anyone who’s proud of the way they look and likes to show off their body or whatever. That’s fine,” she says. “If that makes them feel empowered, then all power to them. Following her recent European tour, Sa-Roc is back in the States working on her next album, Sharecropper’s Daughter. The title is 100 percent autobiographical. She is, in fact, the daughter of a Virginian sharecropper. The concept of the project primarily revolves around perseverance. “The album kind of highlights the genetic connections we have with our family and extended roots and how that can manifest in terms of emotional wiring and behavioral patterns. It speaks to the way that generational or historical trauma can affect and influence your development. This album talks about some of those things and how my personal experience was shaped by my family history. The album concept was inspired by my father’s experience with sharecropping and how the pain and legacy of that has affected his life and so many black families in this country, resulting in residual trauma. You ain’t gotta be an angel to have wings. Sa-Roc, who signed with Rhymesayers in 2016, is just getting started, although her stacked catalog would suggest otherwise. She’s already unleashed nine albums, one mixtape and two EPs. Overall, she wants to leave a legacy of authenticity and substance — and she’s well on her way. “[I want to] speak about important issues that may make people uncomfortable but also makes them think critically about what they’re listening to,” she says after careful consideration. “I want to inspire people to feel empowered, to speak their minds freely and to define themselves on their own terms. But that isn’t all. Sa-Roc also intends to make sure she represents herself in a way that celebrates her African culture and traditions through her jewelry, clothing and spiritual expression. “It’s important for me to also present that aesthetic image as well,” she says. “So, yeah I wanna make my mark by creating art that is socially conscious, honest and very intentional — like the way that people remember [essayist] James Baldwin or [author] Zora Neale Hurston for being incredible contributors to culture. I would only hope to have that kind of impact.